I suppose Disneyland was also a field trip post since it's not the Bay Area, but I get especially excited when I can try mac and cheese offerings across California state lines. Recently, I visited Chicago for a long weekend, and when friends and I found ourselves at ROCKS in the Lakeview neighborhood, I decided I should probably give a Chicago option a go. 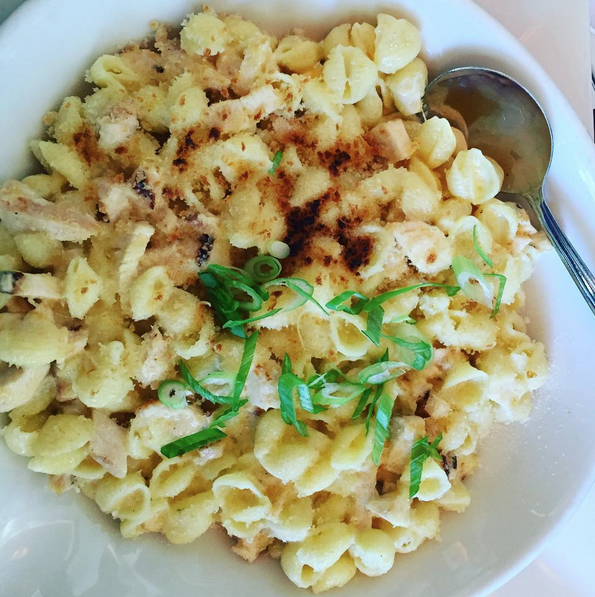 ROCKS has named their dish Mac & Cheesus! Kind of a funny title. It contains smoked gouda, jack and cheddar cheese, diced chicken breast and is topped with some breadcrumbs and scallions. I wish I could say it was as tasty as a Chicago deep dish pizza (now THAT was GREAT), but sadly, not this particular version. The cheese texture was a little dry and the chicken was pretty flavorless, so it just sort of added to an overall bland taste. I think that if you added some kind of seasoning to the chicken, or even attempted a kind of BBQ chicken flavor, it would probably give this mac the kick that it's missing. What is good at ROCKS? Well, I didn't get to try too much while there, but the sweet potato fries sure tasted awesome. Stop in for beer, catch a football game and order some sweet potato fries. And if you want to attempt the fried mac and cheese option (sadly, I could only try one), let me know what you think!